Once again, I am Chicken Little. Back in May when the FCC decided to use the entire $1.6 billion surplus for FY 2015-2016, I predicted that the fund would get whipsawed in FY 2016-2017, as demand rose and the rollover shrunk. Now it looks like I was wrong. Yesterday, USAC told the FCC that it will have $1.9 billion in unused funds available to carry forward into FY 2016-2017. Wow! An even bigger rollover than last year. What does this mean for applicants? It means that the fund will have $5.8 billion available for FY 2016-2017. Even I think it's extremely unlikely that demand will exceed that number, so that means that once again, everyone will get C2 funding. But you know I'm not going to make it all the way through a blog post without finding a little rain cloud where everyone else just sees sun. Where did that huge carryover come from? I don't know, but I guess part of it is the extra $2 billion that the Chairman identified back in March 2014. He promised an extra $1 billion/year for 2 years. So looking ahead to FY 2017-2018, the rollover might be much smaller. And one of the reasons that demand has not been higher is that most school districts had upgraded their Wi-Fi networks for the PARCC and SBAC tests in FY 2014-2015. Assuming a 3-year replacement cycle, 2017-2018 could see a surge in demand. Surge in demand, drop in funding. The current ADA exemption runs out in 9 days. Not to worry, the House is on the job, and has included an extension until 2020 in H.R.2583, which has been passed by the House and sent over to the Senate, where it's been read and referred to committee. But H.R.3675, a pretty identical bill, got that far last year before dying in committee. I'm not a legislative expert, so I feel like I've missed something. Anybody know how we're going to avoid the program grinding to a halt in 9 days? If you're big enough E-Rate geek to read this blog, you've certainly seen Mel Blackwell's Letter to the Field. I think that, as usual, he strikes a pretty good balance between being positive and being frank. While he notes that USAC very nearly hits its goal of processing all the "workable" apps by Sept. 24th (well, there was a big batch of FCDLs that came out Sept. 25th, but that's close enough for government work), he does note that 6,000 applications are "unworkable," and expects that most will be processed within 90 days. "Most" means at least 3,000, so it's possible that close to 3,000 applications will be languishing 90 days from now, which is half-way through the funding year. And Mel admits that the remaining applications tend to be larger than average. “Workable” means that a funding request is filed timely and is complete, with all necessary information, to enable a reviewer to make the appropriate funding decision, and the applicant, provider, and any consultants are not subject to investigation, audit, or other similar reason for delay in a funding decision. Funding requests from applicants that decline to respond to USAC inquiries over the summer may be considered “unworkable” for purposes of this performance goal, though USAC will process these applications as quickly as possible when school staff return for the year. Doesn't "...with all necessary information, to enable a reviewer to make the appropriate funding decision..." exclude most applications? It would seem that if PIA needs to request information from the applicant, the application is unworkable. Unless they streamline PIA procedures dramatically, most applicants will have to supply additional information to PIA, in part because even though the Form 471 is more detailed than it used to be, it still does not collect all the information that PIA needs. It seems to me that if the Form 471 doesn't collect the necessary information to allow 6,000 applications to be processed, the form has some serious shortcomings. But back to the letter. We get promises about how much better EPC will make our lives, but also acknowledgement that the roll-out has not been flawless. I particularly appreciate Mel saying, " the accelerated timing of the deployment did not allow for adequate user testing." I think that more could have been done to bring the applicant and service provider community into planning meetings, but I guess they can't let anyone look behind that curtain, since the FCC considers the application process to be a law enforcement activity whose workings need to be kept secret from the public (and the people going through the process). But here's some good news: "We are committed to...user testing for the new EPC-based FCC Form 471 filing process." Where do I sign up? Check out this announcement: from Sept. 2nd to Sept. 8th, "most Commission resources normally accessible through the Commission’s web site,including access to all electronic filing systems and electronic dockets, will be inaccessible.... The Commission’s web site will remain available, but with reduced content and limited search capabilities. ... FCC telephones will work but voicemail will not, and most Commission staff will not have access to e-mail." But I'm dismayed: it's going to be a really uphill slog to explain that redundant connections are cost-efficient to an organization that knowingly crashes itself for a whole week. Want to make your heart skip a beat? I've got 2 ways to do it, courtesy of USAC. The first one applies to everyone. Go to the Data Retrieval Tool, and look up your funding for FY 2007. Isn't it exciting to get "No Records Found Matching Your Criteria" where your funding should be? Don't worry, it's not you. All the data from 2007 is gone. Where did it go? No idea. When did it vanish? I can say for certain the data has been missing at least since yesterday morning, but that it was there a week earlier. Does anyone have a "No Records" sighting for 2007 before yesterday? The second only applies if you submitted (or certified) your application after 8:00 p.m. Eastern time on the last day of the window. If you did, go to the 471 Display page, put in your 471 number (if you didn't submit late, try using 471 #1051523), then click the "Display" button. Look at the "Date Submitted" and "Date Certified." April 17th?! Out of window?! Not to panic; the display tool seems to be showing you the date UTC (Coordinated Universal Time (the acronym is a sort of anagram, but at least it's properly capitalized, unlike "E-rate")) instead of Eastern time. So don't worry; your application is in window. Probably. In the old 471 Display page, you would have had "Certified - In Window" at the top of the form to calm you, but now you have to go to the Application Status tool to bring your pulse back to normal. E-Rate is always a thrill! As promised, today we'll look at comparing the cost of fiber leases (lit and dark) to self-provisioning and bandwidth service agreements. I tried to build a spreadsheet that broke out every conceivable cost. Under a normal contract, you would probably be leaving the vast majority of them blank, but I think PIA is going to be instructed to ensure that all costs are being considered, so you should be prepared to defend every number in there, especially blanks. You can see that in my hypotheticals, I didn't fill in every number for every type of service. How to use my spreadsheet? Fill in the yellow blanks from amounts in the bids you're considering. Feel free to leave blanks for amounts not included in the bid. (The spreadsheet assumes that you've already selected the most cost-effective solution in each category, so there is only space for one Dark, one Lit and one Self-Provisioned.) You can fill in grey blanks, too; I greyed them out just because I thought it was unlikely that your contract would have those fees, but they're still included in the calculations. Notice the tab for the BandwidthNeed worksheet. It's basically yesterday's worksheet, and here serves 2 purposes. First, the cumulative costs are copied into the Cumulative Cost area of the CostCalculation worksheet, so you can compare to the costs to your leased solutions. The second purpose of the BandwidthNeed worksheet is to give you a basis for stating future bandwidth needs. You'll need that to figure out when you'll need to buy new electronics. If you look at the sample numbers I put in, a 1 Gbps connection is projected to be enough until Year 11. I rounded it down to Year 10. The handling of upgrades is a little clunky. For lit fiber, I assumed that equipment would be leased (or included in the cost of the bandwidth), so it's just a matter of guessing...er..."determining" how much the monthly fee will change. For dark fiber leases and self-provisioning, I assumed that a bandwidth upgrade would probably mean an equipment purchase. So over in cell H8, you'll see that I'm anticipating an equipment purchase in Year 10 (120 months into the contract). There are two rows, so you can put in a second upgrade if you want. You'll notice that there are 3 terms available. In the first row of each term, in column F you'll put the length of that term in months. (Note that if your term is not divisible by 12, there will be an error in the Annual Cost for the year during which the term ends.) Fiber contracts often have 2 terms; the initial term, when you're paying off upfront costs, and subsequent term(s), when you're just paying maintenance. I added a 3rd term for flexibility. In the hypothetical contracts I put in, I have an initial term of 5 years, because the hypothetical dark fiber lease has 5 years of higher fees paying off most of the cost of stringing the fiber, then a much lower fee for the next 15 years. Then I have the second term end 10 years into the contract, where I'm anticipating the upgrade to 10 Gbps will increase the Monthly Cost of the lit fiber lease. The Monthly Cost of the dark lease and self-provisioned don't change, but you'll notice that the equipment purchase from H8 bumps up the Annual Cost in Year 10. Contracts with terms that are not whole years will cause a miscalculation; for example, if your first term is 42 months (3.5 years), the spreadsheet will act as if it were a 48-month (4-year) contract. Any feedback on the spreadsheets would be welcome. The blue column is the number of entities that applied in FY 2014-2015, and applied again in FY 2015-2016. The red column is entities that didn't apply last year, but did apply this year. The green column is entities that applied last year, but didn't apply this year. The most significant bar for me is the green bar for Schools. Almost 30% of schools that were in the program have left! I guess it's not really surprising. If you're a single-building school, you have maybe 10 phone lines, 2 cell phones, a cable modem, and a website. The phone lines were running you about $3,000/year, the cell phones $720,the cable modem $1,500, and the website $1,200. Let's say you're able to prove that 1% of your kids are low-income and you got a 40% discount. Your funding was close to $2,600 last year. This year? Maybe $1,300, if you're able to show that most of the cell phone bill was for voice. Next year? $600. (Not able to document enough low-income students? Last year's $1,300 in funding becomes $300 this year.) If I'm one of those schools, I might drop back into the program one year to collect my $150/student in Category 2 funding, but otherwise, it's not worth my time. And then there's the data that's not on the graph: according to the US Dept. of Education, there are 30,861 private schools in this country. So school participation in the E-Rate has dropped from 30% to 22%. Maybe they're moving into consortia? Nope, the number of consortia in the program also dropped. Hey whoa, those slivers are so tiny, they obscure the fact that almost 30% of the consortia that were in the program last year left this year. So much for encouraging consortia. Not long ago, the Chairman said: "These reforms will only have their intended impact if schools and libraries step up to take advantage of new opportunities. Early indications are that they are up to the challenge." I guess 2,596 schools weren't up to the challenge. Before we open the box, let's just look at the size of it. 4 pages of pre-amble, 8 pages of ESL. And shaking the box a bit, I see that the ESL rules are rattling around in mostly empty pages. Uh oh, looks like we're stuck with ESL Lite for another year. The card attached to the box is not bad: the proposed ESL was released on May 21st, with comments due by June 22nd. A month for comments gives us all a long time to ruminate. And the early due date for comments means we might get an ESL in the summer. That's only fair, since at the recent fiber WAN workshop, the FCC wanted applicants to get 470s up in July. The package has a meager ribbon: In the past, the ESL was always in Docket 02-6. Somewhere along the way, Docket 09-51 got thrown in. Last year, they added Docket 13-184, the docket created for the E-Rate modernization NPRM. This year, we're down to Docket 13-184. Is Docket 02-6 going the way of the dodo? Why not a new docket for the proposed ESL each year? We need to do something to address the E-Rate docket deficiency. The single docket is good news for paper filers, since it means they only need to send one copy along with the original, not the 5 copies they had to send when 3 dockets were listed. Oh, dear, I don't like the pattern on the wrapping paper: the small "r" in "E-Rate." At least the use was consistent. And again the phrase "more commonly referred to as the E-rate program," when as I've said before, the capital "R" is more common among Congresspeople, the press and FCC Commissioners, and even the Chairman (at least until recently). First smile comes from a footnote: "...we do not invite requests for reconsideration of the E-rate Modernization Orders as part of this notice seeking comment on the proposed funding year 2016 ESL." In other words: "Don't tell us you want Web hosting and voice back. Tell us what you think about the wording and format." "The proposed ESL adds equipment necessary to make a broadband service functional to the list of eligible costs for leased lit fiber, dark fiber, and self-provisioned broadband networks. This clarification is necessary to fully equalize the treatment of lit and dark fiber and to support self-provisioned broadband networks." Yes, and combined with the earlier "...applicants must seek competitive bids for network maintenance and operation, and all other eligible services and equipment," it means that dark-fiber companies can't make their bid look cheaper by failing to include the cost of electronics. A win for the phone companies. "...the costs for bundled voice and data services provided over a single circuit, must be cost allocated." That's got me worried. Am I going to have to make up a number for the miniscule portion of my 100 Mbps circuit that is being used for VoIP, and then apply the lower voice discount to that? We'll see when I get to the actual ESL. "...applicants that may be receiving ISDN as bundled voice and data service...." Nope. ISDN is a data service. It's just that no one uses it for anything but voice. (Is there anyone out there still using 3 BRIs for videoconferencing? Please tell me no one is using a BRI to dial up the Internet. And a PRI is just a T-1 set up for voice, so if someone's using it for data, it's just a T-1.) Also, at least around here, unless the PRI has been there for more than 3 years, when a provider gives an applicant a PRI, it only stays a PRI until it hits the service provider's router in the applicant's building. It leaves the back end of that router as IP packets. Hey, look, comments to be filed at http://fjallfoss.fcc.gov/ecfs2/! Faithful readers will know that I miss those icelandic waterfalls. Alas, it just forwards you to the real page: http://apps.fcc.gov/ecfs//. Stupid Web trick: For those of you that miss hraunfoss as much as I do, you can use http://hraunfoss.fcc.gov/ecfs2/. Svartifoss does not work, so I guess the FCC never took my suggestion to use that name. including a glossary of terms, is available at USAC’s website at http://www.usac.org/sl/. The documents on USAC’s website are not incorporated by reference into the ESL and do not bind the Commission. Thus, they will not be used to determine whether a service or product is eligible." So you want to know what is meant by "Radio loop" or "Interconnected voice over Internet protocol"? Go look on USAC's Web site. But that definition is not binding, so you're really just guessing. Hey, where is that glossary? I looked in the Reference Area: nothing. I searched for the word "glossary" and the only two uses of the word were here and here, with both pages saying the glossary was part of the ESL. So the ESL says the glossary is on the USAC website, and the USAC website says it's in the ESL. Beautiful. OK, let's see which digital transmission services get us to 1) broadband (defined by the FCC as 25 Mbps) and 2) 100 Mbps (the goal set in the E-Rate Modernization Order). So if we tossed voice out of the program, is it time to start tossing digital transmission that doesn't help us get to the goal of the program? Or at least get rid of circuits that aren't even broadband? "Applicants may seek special construction funding for the upfront, non-recurring costs of deployment of new or upgraded facilities, including design and engineering, project management, and construction of network facilities." Does that mean I can get E-Rate funding for the cost of a design firm to write my RFP? Or is it more like the design of a C2 solution, which has to be done by the installer right before installation? If the FCC wants top-notch fiber RFPs, they should pay part of the cost to create them. "The reduced discount rate for voice services will apply to all applicants and all costs for the provision of telephone services and circuit capacity dedicated to providing voice services...." Hmm.... "Dedicated," eh? Well, you can't really "dedicate" a portion of a circuit in a packet-switched network, so I guess this only applies to dedicated circuits. That's OK.
"Firewall protection that is provided by a vendor other than the Internet access provider or priced out separately will be considered a Category Two internal connections component." By the people who brought you the On-Premise Priority One Equipment morass, it's the brand-new "Off-Premise Category Two Service," coming soon to an ESL near you. I guess we already had O-PCTS with cloud-based WLAN controllers. I dislike loopholes, but I have to say that O-PCTS is a better idea than O-PPOE, because no one's trying to cram things into C2. "Access points...such as wireless access points." That implies that there are access points that aren't wireless. If such a device were not wireless, it would be called a "hub." Hey, UPS is just listed as eligible. There is absolutely nothing in the ESL which says a UPS is only eligible if supports eligible equipment. So go ahead and plug your ineligible servers into that E-Rated UPS. Why do I think some service provider is going to try to jimmy their video server into the Caching definition? "The agreement or contract must specifically identify the eligible internal connections covered, including product name, model number, and location." Why? "Upfront estimates that cover the full cost of every piece of eligible equipment." That implies that as long as my upfront estimate is for less than the full cost of every piece, I'm good. Wait! We just heard last week that the FCC will be requiring RFPs for self-provisioned fiber, and requiring that applicants seeking self-provisioned fiber have to solicit bids for leased fiber. How is that not mentioned? That's a whopping new and unusual condition on eligibility. It should be in the ESL. Does anyone else feel like this blog post is longer than the ESL? Mostly, I agree with Chairman Wheeler's latest blog post. But of course, I'm going to focus on areas of disagreement. It's sort the inverse of the new ESL: I'm not going to list everything I agree with, so if something he said isn't mentioned in this blog post, you can assume I agree with it. Unless I have disagreed with it somewhere else in this blog or filings with the FCC. First, the most critical issue: the Chairman used a small "r" in spelling "E-rate." No, no, no. As recently as September, he was using the big "R." What happened? Next, a disagreement that seems nitpicky, but is kind of important. The Chairman talks of "supporting cutting-edge, one-to-one digital learning." From what I've seen, schools have blown right by 1:1 and are passing 2:1 and wondering if it will stop at 3:1 (phone, laptop/netbook and tablet/gaming device). It's important because it affects the recent excitement about "duplicative" services. Because a lot of schools aren't going to want student smartphones using the same Internet connection as online testing. So we'll increasingly see schools buying a separate Internet connection for the students' second (and third) devices (and the Internet connection for testing is actually going to be 2 connections, because if testing gets paused by connectivity problems, it's in the papers). Unfortunately, the current duplicative policy is based on the mistaken belief that each student has at most one device (and the mistaken belief that a school can rely on a single connection). The "Max. Demand" column shows the maximum demand for each discount band, from a spreadsheet I made back in June. The "Requested" shows what applicants actually requested, based on USAC's Demand Estimate. It's a bit of a blunt instrument, but it does show roughly how voracious demand was. Except for high-discount applicants, I don't see a release of pent-up demand. The 80-90% applicants went after it a bit, but requests have been over $2 billion in recent years, so I don't think $1.3 billion is big. Ooh, some example applicants, those are always fun. How did Kindred, ND get selected? I just wonder what made them the poster child for small rural C2 requests. The application hasn't been through PIA, so I'm not going to discuss what I think of the equipment in the request or what it costs, but I do want to point out one thing. According to the 471, the Kindred school district has 689 students, giving them a C2 budget of $103,350.00, so the total pre-discount charges of $98,725.00 fits in nicely right? Nope. Unfortunately, the high school only has 299 kids, so it only has a budget of $44,850.00, and since the district opted to split the cost evenly between locations, each location has a pre-discount cost of $49,362.50. So right away, PIA is going to knock $4,512.50 off the pre-discount amount, which means Kindred loses $1,805.00 in funding because the FCC decided that $150-in-5 budgets have to be divided by location. In general, does anyone think that an elementary school with 390 kids really needs 30% more C2 funding than a high school with 299 kids? Because that's what the rules say. And you know what Kindred's E-Rate funding will be in 2 years? $0. Because their C2 budget is almost used up, and their voice discount will drop to 0% by then. OK, so they'll still get funding indirectly as part of the big ND School Net consortium, but they will no longer be filing a 471. Actually, I guess that's what the FCC wants: everything through a consortium. The Philadelphia School District gets mentioned, too. Yes, that $5.7 million will help connect their kids to Wi-Fi. But in the 5 funding years before that, the average annual request was $6.3 million. And the overall average since the start of the program is $16 million per year. So $5.7 million is only exciting if you're thinking of the last 2 years, when the FCC decided not to fund any P2. Philly shows us another dark side of the per-location $150-in-5 budgets. Open their application, go to the Item 21 information, and expand everything. The relatively simple purchase of some wireless gear has exploded into a bookkeeping nightmare. Imagine an auditor trying to figure out if the amount listed for each school was used in that school. And what did we gain from all that complexity? I have to admit, though, that the FCC's demand projections were better than my doom-and-gloom. And the reforms are driving funding to broadband and Wi-Fi. So overall, I think the Chairman has a right to crow. OK, so maybe I was a little pessimistic. 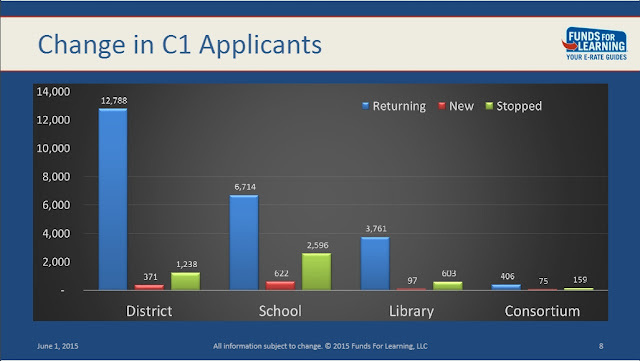 My pre-window estimate was that Category Two (C2) funding would run out somewhere between 70% and 50% applicants. Well, last week USAC released the official Demand Estimate, and the total demand is just over the $3.9 billion cap. Then 2 days later, the FCC issues an order directing USAC to cover it all. Now it's official: everybody who applied correctly will get C2 funding in 2015-2016. That is very good news for the stability of the fund. If demand was higher than the cap, how did they fund everyone? The rollover, of course. Because the FCC has chosen to violate their own rule and deny all C2 funding for the past 2 years, USAC is sitting on $1.6 billion in unused funds. So they can cover the $0.019 billion over the cap. But the way they've chosen to cover it is bad for the stability of the fund. To maximize the safety of the fund, the FCC should have raised the contribution factor to pull in the cap, $3.9 billion, and then used just a smidgen from the $1.6 billion unused funds war chest. Because it is possible that demand next year will be way over $3.9 billion, and the FCC will be wishing it still had that unused slush fund. OK, that seems extreme, but I think they should have left some of the money in the unused pile. For example, they could have said, "OK, here's that extra $1 billion that the Chairman promised for FY 2015," and left $600 million in the unused pile for next year. What did the FCC do? They said: "We ... direct USAC to fully fund eligible category one services under the new cap. We also direct USAC to fully fund eligible category two services, first using as much as $1.575 billion in E-rate funds unused from previous years, and then using any additional funds needed under the new cap to fully meet demand." Seems reasonable, right? No, it's actually a mistake. Maybe a big one. Walk with me as we go through what will happen. First, USAC will fund Category One (C1). Total C1 requests are $2.25 billion. USAC usually ends up denying/reducing a little over 10% of the total requested amount. So USAC will probably approve something like $2 billion in C1 funding. Next, USAC will start using the $1.6 billion in unused rollover funds to cover P2. Total C2 requests are almost $1.7 billion. Applying a 10% denial factor, we get to about $1.5 billion in approvals. Hey, we didn't eat up the whole rollover! Did you notice the problem? The amount that E-Rate pulled from the Universal Service Fund (USF) for FY 2014-2015 was just over $2.4 billion, the program cap. But in 2015-2016, the E-Rate is only going to pull enough to cover C1, which is going to be something like $2 billion. Now normally, I would say it's a good thing that the E-Rate program will be reducing the contribution factor. But does anyone believe that demand is going to decrease next year? Does anyone believe that the FCC is going to find another $1.6 billion for FY 2016-2017? Remember that the big reserve is the result of no C2 funding for 2 straight years, and by leveraging the fund. Neither of those options is available in the future. So next year, it is possible that the E-Rate will need to pull $3.9 billion from the USF. Since we're only taking $2 billion this year, that almost doubles the E-Rate's demand on the USF, which means the contribution factor is going to spike. This year's "yippee! we cut spending" party will give us an "oh my aching contribution factor" hangover next year. And the spike will hit in July 2016, just a few months before the elections. If I were Hillary Clinton (or any Democratic candidate for Congress), I would be on the phone to Chairman Wheeler right now. And I would be saying, "Take $3 billion or so from the fund this year, and let's have the 'yippee! we cut spending' party at this time next year." Meanwhile, Commissioners Pai and O'Rielly should start resting their voices now, so they'll be ready to give a proper outcry at this time next year. Early reports indicate that USAC has misunderstood what they asked for on the Item 21 Attachments, and PIA is going to be asking about "duplicative services" over and over. See, if your ISP provided the circuit from your district hub to the ISP's POP, you were expected to describe that as "Internet and Transport" instead of "Internet only." (I believe the thinking was that the information could then be used to better compare Internet pricing if you knew whether it was just the Internet port or port+circuit.) Of course, then you'd also have a WAN providing Transport from the district hub to the other locations in the district. So now you have Transport twice for each of the non-hub locations, so it looks duplicative. And PIA is going to ask about it. It's not duplicative, of course, which I hope PIA will understand quickly, but it creates a lot of extra work. Meanwhile, you can't really draw any conclusions about the price of an "Internet and Transport" FRN, because you're allowed to dump your WAN (a telecommunications service) into an Internet Access FRN (a kludge that was created to allow statewide/regional networks and ESAs, which are not telecom providers, to provide WAN connections to individual schools). Ironically, the warning that duplicative services are not eligible was removed from the 2015 Eligible Services List because the FCC wanted to "streamline" the ESL. The FCC apparently feels that if you wanted to get $3,000 in funding for your school, it is your responsibility to find, read and retain the information in paragraphs 22-24 of the Second Report & Order (written in 2003). In short, now that the duplicative services rule is well hidden, PIA is going to try to enforce it using misinformation from a system which had to be weirdly designed to allow grey-market sales of telecommunications services by states, ESAs, et al. I opened USAC's Annual Report when it first came out, but then the filing window got in the way, so I'm finally getting back to it. If you're looking for a reasoned summary, you should know better than to look here. As usual, it's just going to be a waggish look at whatever pops out at me. Alas, I guess someone noticed and now the USAC PDFs both have two-page-wide layouts, so "TOGETHER" is no longer split, but the FCC retains the old, threatening version. "In 2014, the FCC continued to pursue an aggressive modernization agenda for the universal service programs.... These changes have created a dynamic and exciting environment for our organization...."
"Holy crap! Did you have to change everything in one year?!" "High Cost Program"? I thought it was renamed the Connect America Fund. That change should happen now, because "High Cost" is a terrible name for a government program. "Lifeline Program"? When did the Low Income Program get a name change? The graph only shows the last five years, so it ignores that there were once over 8,000 service providers in the program. The number of service providers dropped by 10% from 2013 to 2014. Meanwhile, P2 demand dropped by only 3.6%. Why would that be? I'm guessing that every year, a new batch of P2 providers thought they'd found the Promised Land, but left the program in dejection, to be replaced by an eager new crop every year, and after 15 years, there aren't any naive P2 vendors left to replace the dejected ones that are leaving. I expect a large drop in the number of service providers in 2015, with so many services cut out of the program. Here's an incorrect statement on page 12: "USAC paid nearly 98 percent of invoices within 30 days of receipt." Do a little math on the invoicing numbers on page 16, and you'll see that 6% of invoices were rejected. And it's not clear whether that includes "pass zero" invoices, where the invoice is approved, but for $0.00, so nothing is paid. So USAC paid at most 94% of invoices. Page 16 has a chilling blast from the past: "internal controls." Years ago, that was PIA's way of saying "mind your own business" whenever you tried to find out why you were being asked all these questions. Now we have the secret 700-page tome of PIA "procedures," and "internal controls" means that USAC is keeping track of its money. Ooh, let's play with the application processing numbers on page 16. The FY 2014 numbers don't look too bad: by the end of 2014, half way through the funding year, only 5.7% of applications remained undecided. Not bad. About 53.1% of applications were approved before the start of the funding year, which seems low unless you know the recent history of the program. The FY 2013 numbers aren't so pretty. At the end of the funding year (2Q 2014), 5.7% of the applications were undecided. At the end of 2014, six months after the end of the funding year, the undecided percentage was down to 4.7%. At that rate, they'll finish up sometime in 2018. The percentage of applications rejected seems pretty steady around 17%. Wait, what is a "rejected" application? A 471 that was rejected before looking at individual FRNs (for example, an application filed outside the funding window, or never certified)? A 471 on which all FRNs were denied (perhaps en masse due to, for example, not having a 470, or each dismissed on its own (lack of) merits)? A 471 on which at least one FRN was denied? I find I don't have much patience for the financials, but let's see what catches my eye. Looks like USAC is holding almost $8.5 billion to cover future payouts under "Assets held for the Federal USF." That's up from $7.7 billion in 2013 (and $5.4 billion in 2006). Is this where the Chairman is going to get his extra $1 billion/year? I'm betting it's just the CAF reserve that the FCC started building at the end of 2011. I am tempted to do some analysis of the table on page 43, but I did that analysis last year, and I doubt much has changed. How was that new form? Well, I'm finally recovered from the filing window, so I thought I'd give some feedback on the new online form. All of these observations were made in the heat of filing, and I'm unwilling to go back and verify them, so they're a little suspect. They're also in no particular order. I'll divide them into pluses and minuses, but otherwise they're just pretty much in the order in which I was nettled by them. The "Back" button saves whatever you've put in. Sometimes. In the old days, "Back" meant "discard everything I just typed in and go to the previous page." The countdown clock still shows the seconds ticking away. I just love that. If you paste in a number with extraneous spaces, the spaces are stripped out. On the last couple of days, I didn't notice any significant slowdown or failure. Some errors are automatically fixed (like if you put in a Service End Date outside the Funding Year on a Month-to-Month FRN). Item 21 is a pop-up in front of the browser window (the browser window is grayed out). If you click outside the pop-up but inside the browser window, it makes the pop-up vanish, and any info you put in vanishes. So if you've completely filled the attachment, but you want to switch to the vendor's bid to check the price of one of the items, when you click back in the browser window, beware! Click on the grayed-out part of the window, and you have to start over again. On a big Category 2 FRN, it's an easy way to lose a half hour's work. Why do I have to make a selection under Burstable Bandwidth for an FRN that's just POTS lines? [Perhaps the programmers thought Burstable POTS was a clever shout-out to Legend of Zelda?] At least you can leave the bandwidth fields empty. You can't paste in an amount if it has a dollar sign or comma in it. You don't get an error message, it just acts like you never pasted. After pasting 3 times and seeing nothing happen, I figured something was up and starting stripping out punctuation. It's tedious to have to fill out several pages where you used to have only one. Block 1 used to be one page, now it's several pages. Simpler pages, but still. And Block 5 is a dizzying array of pages, popups and buttons. But I guess most of the extra Block 5 pages are the result of the amazing increase in the complexity of Block 5. If you import Block 4 from a Category 1 application into a Category 2 application, it doesn't fill in the enrollment in the Budget Calculation section, even though the enrollments are right there in the Discount Calculation Worksheet. Chrome autofill doesn't work. Not a big deal for normal applicants, but I was grinding my teeth every time I had to type my Consultant ID again. If an Item 21 item has only one entity, you have to check that services are shared equally among all entities. I want it to say "shared equally among all entity." Item numbers are gone. No longer can I say: "Whatever you do, don't check Item 23f" or "The person in Item 6a should be the person who will answer application reviewers's questions." It was handy shorthand for us E-Rate geeks. We still have "Item 21 Attachments," even though there is no Item 21 any more. It was unfortunate jargon before, but now it's just inscrutable. Tab order is messed up. For example tab from Item 23d and you end up at the "Certify Online" button, which is definitely not where you want to be, because you still have to check all those certifications. Why force people to check all those boxes in Block 6? Why not just one big fat certification? It would streamline the process to have applicants ignore one big certification rather than having to ignore a dozen little ones. You can't tab from checkbox to checkbox on the Certifications page. Block 6 used to be: click the first box, tab, space bar (which checked the box), tab, tab, space, tab, type in some number for 23d, tab, tab, space, tab, space, tab, space, tab, space, tab, space, tab, space, tab, space, tab, space, tab, space, tab, space, tab, space, tab, space, tab and then you're filling in certifier information. Those certification checkboxes are too small for a man of my age to click in reliably. When my laptop wasn't docked to a big screen and mouse, it was taking me 2 or 3 attempts using the trackpad and the little screen. Why do I have to give a bandwidth for dark fiber? It's dark; it doesn't have a bandwidth. Some of the fixes are too automatic. If you put a date outside the funding year for a Month-to-Month service, the system automatically fixes it. That's great, except maybe you checked MTM by mistake, and if a message popped up saying "Hey, you put in the wrong date, but it's fixed now." Actually, an error message does appear for a moment, but it vanishes instantly as the form fixes the date for you. And sometimes those autofixes are weird. When you type a date into the contract expiration date box in Block 5, if you type two digits for the year, it automatically adds the "20"; cool! But wait, it changed to "6/30/16" to "6/29/2016." And if you click in there and try to change "29" to "30," you end up some time in the year 2199. So check it out: type in "6/31/16," and it will become "6/30/2016." I spent way too much time trying to imagine what algorithm would unintentionally cause that behavior. In Block 5, if you check "Yes" under "Is every entity on this application receiving the product or service in this line item?" then go back to Block 4 and add a new entity, unbeknownst to you, the box unchecks itself, and the new entity is not part of any funding request. Seems to me if you checked Yes to every entity sharing, that should include entities added later. And even if it doesn't, you should get a warning that adding an entity in Block 4 changes Block 5. Sometimes if you make an error in a pop-up window, the window goes away, and you think you've accomplished whatever you were in that pop-up to do, when in fact you need to go back and do it over. If you aren't ready to put numbers in the Discount Calculation Worksheet, for God's sake don't click in there. Once you've clicked there and opened one of those text boxes, you can't do anything else until you put a number in there. You can't even log out of the application. I was stuck in that box when the system logged me out for inactivity, and I was completely locked out, looking at a grayed-out window (with the countdown clock ticking away) and a pop-up saying: "Number of Students Attending this School as their Home School is required." I had to close the browser window. Overall, the form was better than I expected, and less quirky, but any new form will have its oddities. I was disappointed that we didn't find any new Stupid 471 Tricks, but we'll keep looking. Let the waves begin! The FCC has approved the application review procedures for FY 2015-2106. In theory, PIA could start issuing FCDLs tomorrow. Funds for Learning says 659 applications were in Quality Assurance as of March 24, 2015, so there are applications ready to go out the door. Is it possible that we'll get a wave of FCDLs before the end of the filing window? It could happen: in 2010, the first FCDL came out 13 days after PIA procedures were announced. And back in 2000, the first FCDL was issued April 14. Don't hold your breath: last year the PIA procedures were approved 19 days before the end of the window, but we had to wait 50 days after the close of the window to see the first FCDL. And this year the application process is more complex and has changed a lot. I think we'll be lucky to see a wave in May. A wave inside the filing window would certainly encourage applicants to file earlier next year. But providing carrots to change applicant behavior doesn't seem to come naturally to the FCC, so if they really want earlier applications, look for the stick.